If you ask any New Orleanian to name the city’s greatest music ambassador, the response you’re most likely to hear is “Louis Armstrong.” If you ask the name of its most authentic, no holds barred, tell it like it is ambassador, those in the know will extol the virtues of the man whose words became our city’s voice, whose angst conveyed our city’s pain in the darkest of our days, the post-Katrina aftermath. In New Orleans, there is no other Rose by any name. There is only Chris Rose. It became the anthem heard ‘round the world, arguably one of the most quoted works of prose ever to come from the city, and the stuff of which Fleurty Girl t-shirts are made. Over the next few years, Chris continued to share his views and bare his scars for all the world to see, a rocky road that took him from The Times Picayune to Gambit Weekly to WVUE-TV. Along the way, he garnered two Pulitzer nominations with one victory, landed on The New York Times bestseller list for his book, 1 Dead In Attic, and earned numerous additional accolades. The journey has included countless detours along the way, on the path that now has led him to what some believe has been his destiny all along: telling the authentic stories of New Orleans, one intimate group at a time. 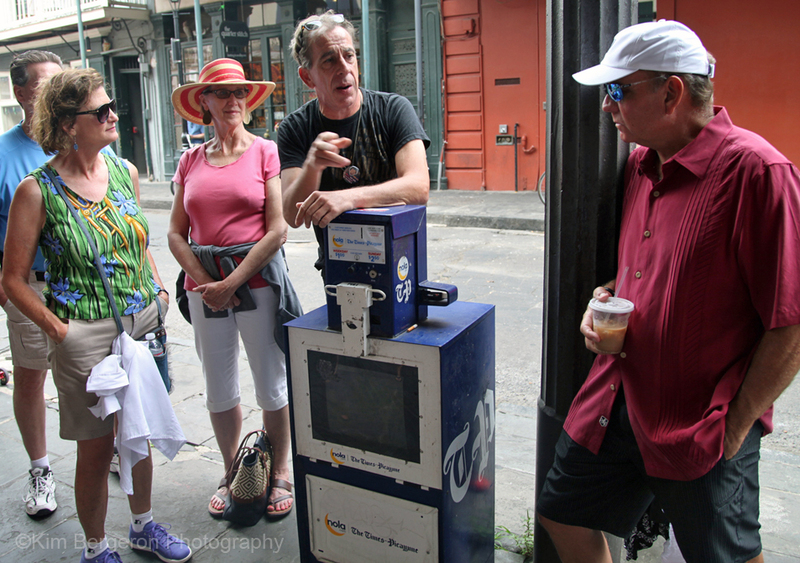 Chris Rose, tour guide, purveyor of truths and master storyteller. So perfect. Now, if you’re looking for an experience that weaves tales of voodoo and vampires and ghosts, however embellished or fabricated such may be, this is not the tour for you. But, as Chris is quick to point out, truth is often stranger than fiction. The stories he tells over the two hour trek through the streets of New Orleans are intriguing, insightful and downright bizarre, laced with sweet nuggets of irony, Louisiana politics and historic oddities. Throughout our tour, the consummate raconteur makes a compelling case for the origins of a myriad of musical genres, and how each has its roots in Louisiana. There are stories of opera and country, jazz and blues, rock ‘n’ roll and even rap music, with a rich tapestry that includes Elvis and Jimmy Buffett, musician incarcerations and Mr. Bojangles, six hour stints of freedom from slavery with intense musical rituals and more. It is all succinctly laid out for us to see, with evidence to substantiate the tour guide’s claims, connecting all of the musical dots. All except polka, that is. Evidently, there are no polka dots in Louisiana. 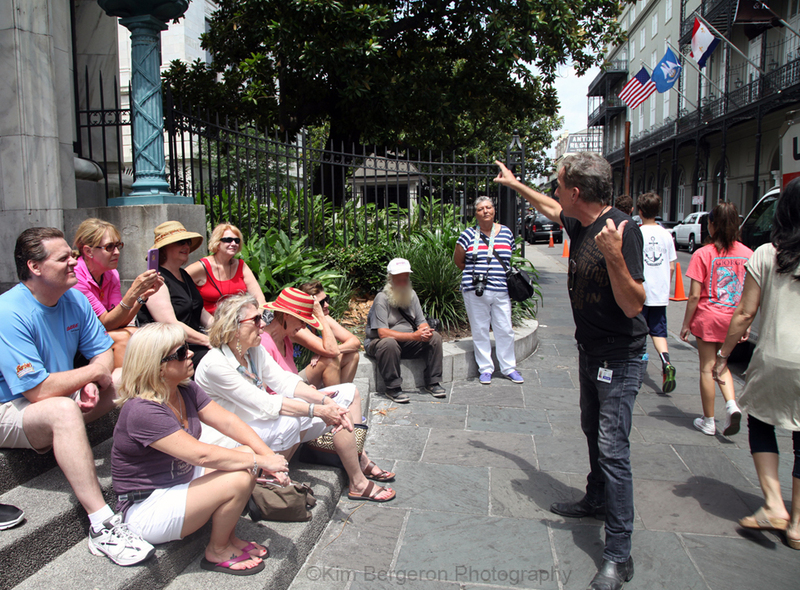 The journey leads the spellbound throughout the French Quarter, with strategic pauses providing seating and shade. This includes a few stops during which Chris towers over, and occasionally rests his elbow upon, The Times Picayune newspaper boxes, all the while continuing his tales. Whether intentional or not, the irony of such is not lost upon us. A stop at one location considered by many to be the most haunted location in the city focuses not on the ghosts, but on a diamond encrusted piano, a former president’s mistress-turned-house-entertainment and Chris’ unusual encounter with the restaurant’s then-proprietor just days after Katrina. Picture in the midst of the devastation a meticulously clad gentleman, seated at a table topped with crisp white linens and fresh flowers, sipping a glass of chilled champagne. That curious scene paved the way to an impromptu tour of the freezers of New Orleans’ oldest restaurant and a massive humanitarian gesture for post-K volunteers. Stranger than fiction, indeed. Up next is the story of the tour guide’s unbelievable experience with Eric Burdon of The Animals, and of the musician’s preoccupation with discovering the true location of “The House of the Rising Sun,” the brothel immortalized in the song of the same name. Folks cling to every word as Chris tells the tale of Eric’s trance-like serenity following the musician’s epiphany when that obsessive quest came to an end, in the most unlikely company of nuns. It’s a fascinating anecdote appropriately wrapped up with a Chris Rose mic drop. And it’s good. The journey continues through Congo Square in Armstrong Park, providing connections of modern day music to the cries of warriors over the beats of percussions. And, as was the case all along the journey, Chris doesn’t just tell the story. He became the story. 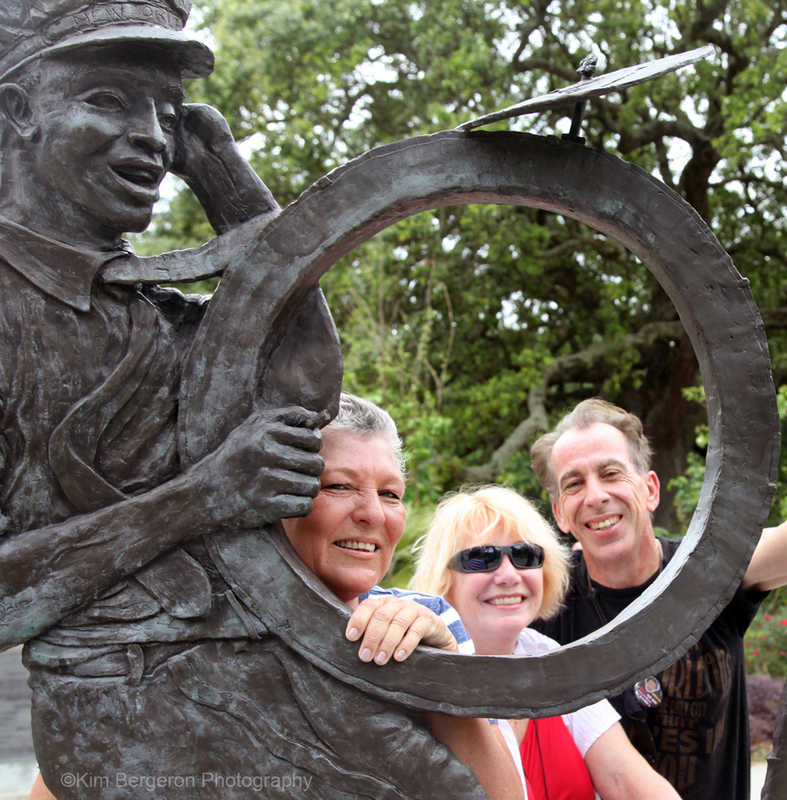 Before leaving the park, there’s a quick stop for a second line interaction with a parade of musicians immortalized in bronze. It’s the perfect photo op for a keepsake documenting one heck of a journey. The last stop is the location that was, once upon a time, a famous recording studio, where enthralled listeners learn more about the roots of rock ‘n’ roll, the early recordings of countless music icons, and a downright hilarious gem about Ernie K-Doe and the mother-in-law he made famous (or infamous?) in his most celebrated, number one hit. Let’s just say she got the last laugh. And right smack in the middle of that final stop, there’s dirty laundry. Lots of it. If there is any part of the tour that is haunting, it is this, the current state of the spot in which so much history was made. 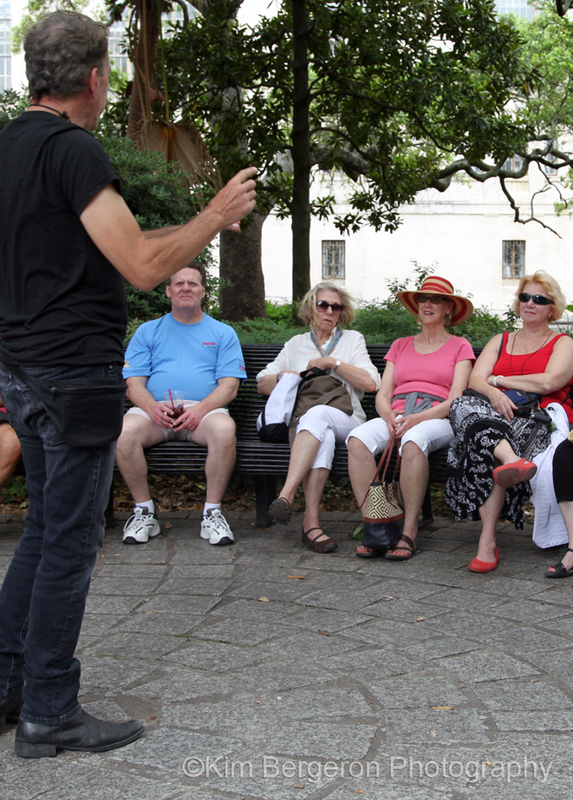 This is the New Orleans Magical Musical Mystery History Tour presented through the eyes of its most authentic son. And it is spectacular. The Chris Rose New Orleans Magical Musical Mystery History Tour can be booked by emailing chrisrose504@gmail.com. For upcoming tour dates and info on additional tours currently in development, follow Chris on Facebook and Twitter @ChrisRose504. The cost of the tour is $25 per person.